The opening of the new Globe Theatre was a great event. 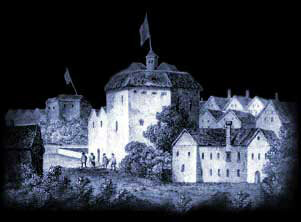 The opening of the Globe Theatre was in the summer of 1598. The building and opening of the Globe Theatre followed the failed negotiations by Burbage to re-new the lease of the 'Theatre', where William Shakespeare and the acting troupe called the Lord Chamberlain's Men had performed. The opening of the Globe Theatre was eagerly awaited by the people of London during the year of 1598. Many would have seen the actors when they played at the Theatre, and waited in anticipation for the new Globe Theatre to open. The location of the Globe Theatre was on the Southbank of the river Thames in Southwark, London in close proximity to the Bear Garden. The picture of the Globe Theatre London Map was taken from an engraving by Claes Van Visscher. The many Londoners who visited the Bear Garden would have seen the Globe Theatre built quickly and heard about how magnificent the Globe Theatre opening would be. To announce the arrival of the new playhouse, the Lord Chamberlain’s Men flew a flag featuring the figure of Hercules carrying a Globe on his shoulders to announce the imminent performance of their first performance, which was going to be Julius Caesar by William Shakespeare. This classical theme was displayed above the main entrance of the Globe Theatre. A crest displaying Hercules bearing the globe on his shoulders together with the motto "Totus mundus agit histrionem" ( the whole world is a playhouse ). This phrase was slightly re-worded in the William Shakespeare play As You Like It - "All the world’s a stage" which was performed at the Globe Theater. The Globe theatre was built in a similar style to the Coliseum, but on a smaller scale. Never-the-less it still had an audience capacity of over 1500 people and this amount increased to 3000 when people mingling outside the grounds. The opening of the Globe Theatre attracted Londoners who wanted to marvel at the new theatre and many vendors who sold their wares in the grounds outside the Globe Theatre. A trumpet was sounded to announce to people that the play was about to begin at the Globe Theatre in order for people to take their final places. In 1993 construction work began on the New Globe Theatre in London. The New Globe Theatre is located approximately 200 yards from the site of the original Globe theatre. On June 12th 1997 the opening of the New Globe Theatre in London was inaugurated by Her Majesty the Queen, accompanied by HRH Prince Philip. Interesting Facts and information about the Globe Theatre Opening. Additional details, facts and information about the Globe Theatre can be accessed via the Globe Theatre Sitemap.